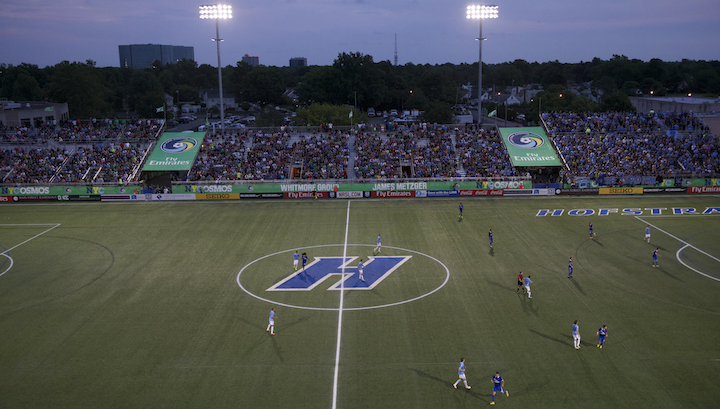 When the New York Cosmos played their first North American Soccer League match in 29 years on August 4, 2013 in Hofstra University’s Shuart Stadium, the scene was magical. Pele was present, honored alongside Giorgio Chingnalia’s son. The opponent was the historic rival Fort Lauderdale Strikers. The stadium was packed. The fairytale match ended in a win thanks to a late game goal off the head of Alessandro Noselli. Approaching three years later, the Cosmos have won two out of three Soccer Bowls. They have defeated local Major League Soccer rivals New York City FC and the New York Red Bulls in US Open Cup matches. They travelled to Cuba for a historic match aired across the world. They raised a trophy in China. Marcos Senna, Raul, Niko Kranjcar and Juan Arango are some of the famous names that have donned their colors. They have consistently put together a strong roster with international and domestic talent. They have had four US youth internationals on the books and have started an academy officially sanctioned by US soccer. There are those that argue that, from a sporting perspective, the New York Cosmos have built the best soccer operation in North America. Despite all of their success on the field, the Cosmos are like house guests that have overstayed their welcome at Hofstra. Their matches at the stadium are scheduled at unappealing times, and fans in the Hempstead area have stopped turning up in respectable numbers. Spring Season 2016 average attendance was 4,302, down from 6,719 during the same period a year ago. The drop off actually began last Fall Season, when attendance dipped to 4,233 per game. Any boost expected from the Brooklyn-bound New York Islanders leaving Nassau Coliseum, across the street from Shuart, never materialized. The honeymoon between the Cosmos and Long Island is over, and the marriage prospects do not look good. The Cosmos were never supposed to be in Hofstra this long. If all had gone to plan, the Cosmos might have been opening a world-class, privately funded 25,000 seat soccer stadium on the border of Queens and Nassau County this season. The Elmont Crossings project has languished in bureaucratic purgatory as the Empire State Development Corporation has refused to choose between the Cosmos and three other bidders. The Cosmos have waited, some would say too patiently, for the ESDC to make a decision. Why Wait On Belmont, Anyway? The allure of Elmont Crossings for the Cosmos brass is understandable. The location places them on the border of Queens, across from Belmont Park Race Track. There is a Long Island Railroad stop, and while it is not a full time stop, that could change with the new investment in the area. With the Red Bulls playing in New Jersey, and NYCFC in the Bronx, the location could help the Cosmos carve Brooklyn, Queens and Long Island out as Cosmos Country. The $400 million dollar privately funded project would give the club revenue opportunities beyond just the stadium, with a hotel, restaurants and retail space on the site. Those additional revenue generation opportunities are unlikely to be available in any other New York metro area location so close to a rail line. “28 acres to build our dream? It is hard to find that in the New York metropolitan area right now,” Stover told CBS. Why Did Shuart Make Sense As A Precursor To Elmont? The Elmont site the Cosmos are bidding on straddles the border of New York City and Nassau County, Long Island. Shuart Stadium is in Nassau County, about a 20 minute drive from Belmont Park Race Track. In theory, a fan base developed at Hofstra should transition smoothly with the team into its bigger, better new facility just 20 minutes away. In the context of the original timeline, Shuart was a good place to start to lay some roots down in the community. Despite the poor quality of the turf, Shuart has several things going for it. Since it is located catty corner from Nassau Coliseum, there is plenty of parking in the area. There are reserved suites at the stadium, a premium seating section at the centerline, office space for the staff and acceptable locker rooms for the players. When the place is over 9,000 in attendance, such as it was for that first reboot match, the two Open Cup derby home matches, Raul’s debut and the 2015 Soccer Bowl, the atmosphere can be excellent. With a capacity close to 12,000, it is appropriately sized for a NASL team. The Cosmos attendance problems may go deeper than Shuart, but the scheduling issues at Hofstra and its inconvenient location for New York City dwellers, most of whom do not have cars and rely on the subway system, are not helping the issue. We will walk through the Cosmos temporary venue options below. We will look broadly at those that don’t work and why before honing in on the realistic Shuart replacements. The New York metro area has a number of stadiums, but very few are a good fit to host NASL soccer. Some are too small and others too large. Some are too hard to get to from the City and others politically inviable. Obviously it isn’t worth moving unless the new location can be better than the current one. 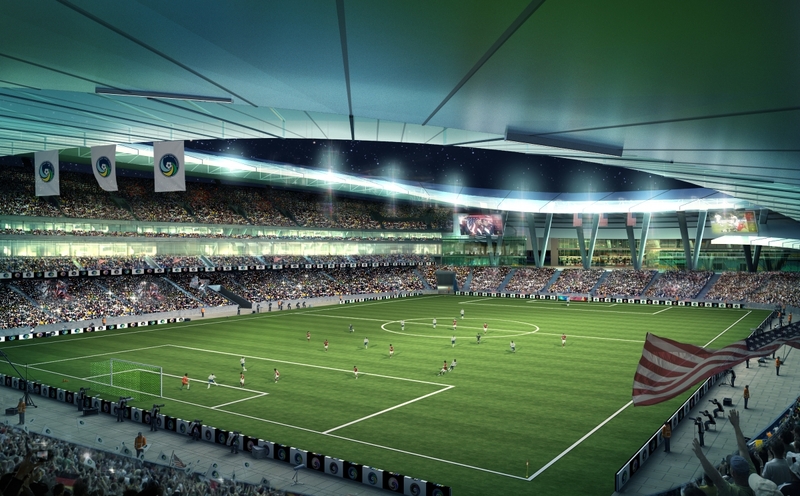 The two stadiums controlled by the Yankees are not options for the Cosmos. Yankee Stadium is clearly off the table, and would be undesirable anyway as the Cosmos would be the third and lowest priority tenant. Enough said on that. Richmond County Bank Ballpark, home of the Staten Island Yankees, would be an interesting option with its 7,171 capacity, sight lines of lower Manhattan and accessibility via the Staten Island Ferry. However, the Cosmos would likely find the Baby Bombers to be uncooperative primary tenants, given the Yankees’ stake in NYCFC. There are a number of small stadiums across New York City suited for soccer, but the Division 2 standard requires a minimum of 5,000 seats and the Cosmos should be looking to do better than that. 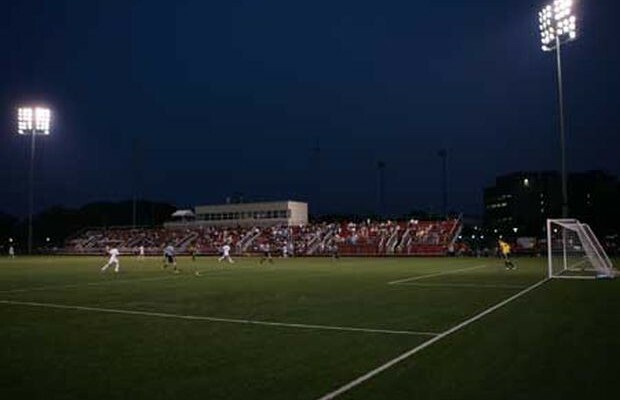 Belson Stadium at St. John’s University has been used several times by the club for its low profile US Open Cup matches. With only 2,600 seats, Belson is too small. The Bronx’s Reinhart Field, Brooklyn’s Long Island University Field, Manhattan’s Columbia Soccer Stadium, Staten Island’s Wagner College Stadium and the Bronx’s Gaelic Park are all easily eliminated due to capacity issues before looking into them any further. On the other end of the spectrum, there are stadiums that are too big for reasonable expectations of attendance for a regular NASL league match. Despite the Cosmos’ historic ties to Giants Stadium, MetLife Stadium is too large a venue and too close to the Red Bulls. Citi Field could be an option for special matches, but as the regular venue it is far too large. Part of the problem with Shuart Stadium is that it is too remotely located from public transportation to realistically expect that City dwellers would come out on a regular basis. New venues that share this problem are unlikely to be better options than Shuart. That eliminates the Long Island Ducks’ Bethpage Ballpark and Stoney Brook University’s LaValle Stadium, both located further east than Shuart on Long Island. Rockland County (NY)’s Palisades Credit Union Park would fail both the capacity and remoteness criteria, while New Jersey’s TD Bank Ballpark and Yurcak Field, home of Sky Blue FC, are both small and far outside the city. Icahn Stadium proves that you can be almost at the literal center of New York City on a map and still be remote in terms of accessibility. The Cosmos have history on Randalls Island, but it is highly inconvenient to get with limited parking on the Island as well as no subway access. The recommended way of getting there is by bus. On top of this, the stadium only seats 5,000. For our purposes, we will assume Stover’s hyping up Nexxfield means the Cosmos will invest in the turf regardless of which temporary stadium they choose. Mitchel Field is on this list because Stover’s comments mean that it is clearly under consideration by the Cosmos. It currently serves as the club’s training ground. The appeal of moving to Mitchel Field, just around the corner from Shuart Stadium, on the other side of the Hofstra Campus and Nassau Coliseum, would be that you could schedule games at better times and continue to build on the same audience that you had at Shuart. The question is, does that truly address the core problems of why the Cosmos are not drawing? It does not address that the local community’s interest in the team seems to have waned, and it shares the same accessibility issues as Shuart for those from the City. Moving to Mitchel would seem to be a half measure. The Cosmos will play their first match at Coffey Field on June 15th, should they advance past the Jersey Express in the US Open Cup on June 1st. 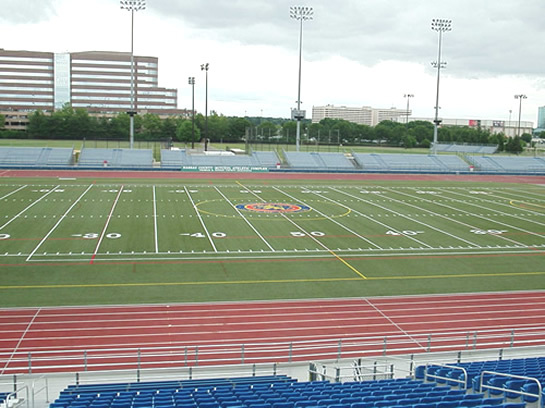 Coffey Field is good size for NASL, at 7,000 capacity, and it is located in the City. Even still, Coffey’s accessibility is not great. It is over a mile walk from the nearest subway line and there is limited parking available on-site. A much bigger drawback of Coffey is that it is in the same borough that NYCFC is already established in, giving the Cosmos an uphill battle towards establish themselves as the primary soccer team of the area. For example, the Cosmos will be the away team, should they advance to the June 15th match at Coffey. Accessibility: 1.2 miles from Kingsbridge/Fordham Rd subway stops. Limited parking on site. 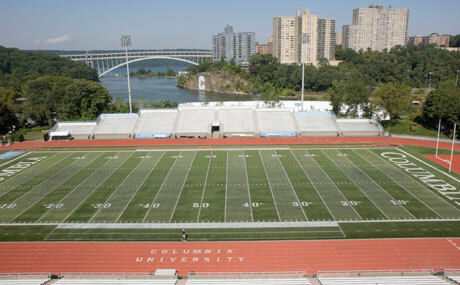 Columbia University’s Wien Stadium offers the Cosmos an option on the northern tip of Manhattan. Wien is a short walk from the subways and public transit is the best option as on-site parking is very limited. New York City FC has considered building their permanent stadium on the site, in a proposed ground share with Columbia. 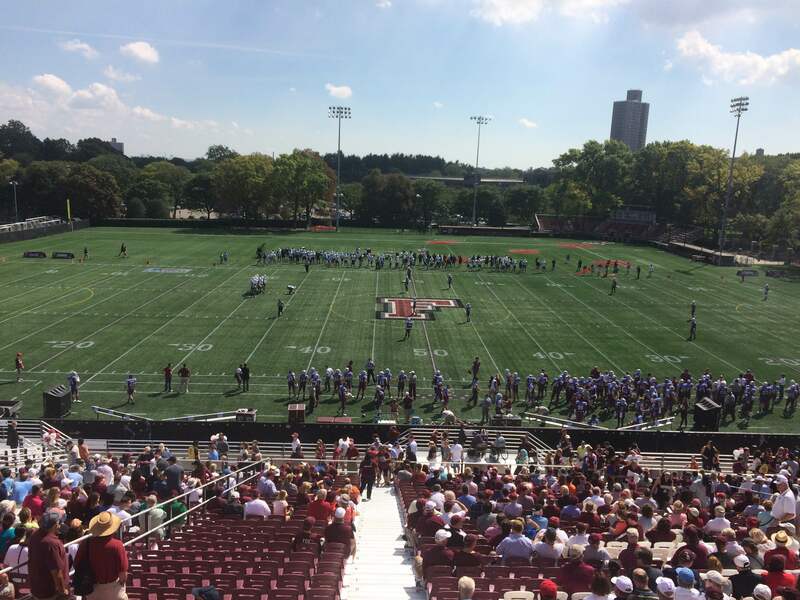 While playing in Manhattan would increase the team’s relevance in the City enormously, one must consider whether they would be building for the future in the location. If building a stadium in New York City is very hard, building in Manhattan is even harder. Ask the New York Jets. Accessibility: 0.3 walk from the 215 street subway stop. Limited on-site parking. Neighborhood parking garages available. 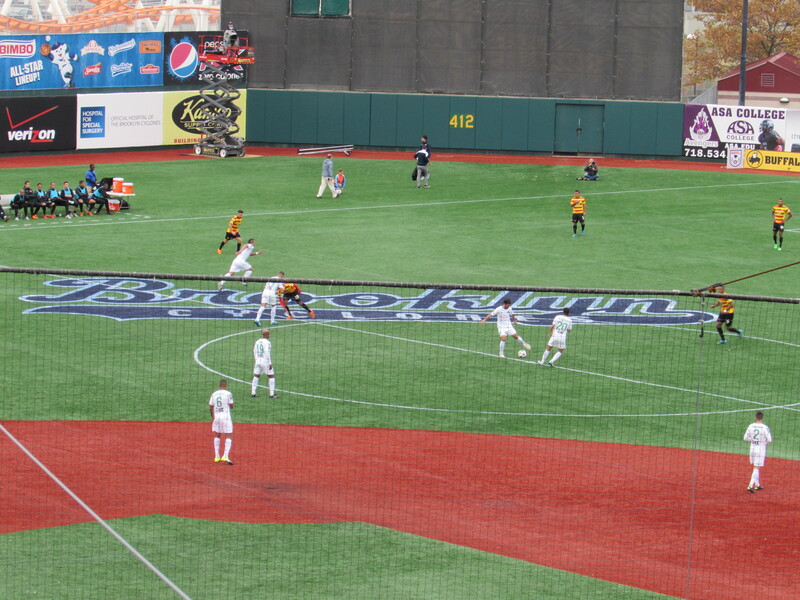 The Cosmos have already played two games at MCU Park. Home of the New York Penn League’s Brooklyn Cyclones, the stadium is located on Coney Island. Heading to Coney Island for a Cosmos game allows fans to plan for an entire day of entertainment. When I took my son to the Cosmos first match there, we arrived several hours early, rode the Cyclone rollercoaster a few times, visited the amusement parks in the area and ate hot dogs at Nathan’s before heading over to the stadium. The neighborhood adds to the fan experience. While Coney Island is not necessarily easy to get to from Manhattan, there is a subway line nearby and it positions the team in the Brooklyn-Queens-Long Island section of the New York metro area, allowing the club to carve out a niche separate from New York City FC and the New York Red Bulls. The main negative to MCU is the baseball turf, which the application of Nexxfield could resolve. Accessibility: 0.3 miles from Coney Island-Stillwell Ave subway stop. On-site parking. Shouldn’t the World Famous Brand Be Helping Here? The New York Cosmos have arguably the most globally recognized brand in North American soccer, thanks to the efforts of Pele, Franz Beckenbauer, Carlos Alberto and friends so many years ago. The Cosmos of the late 70s and early 80s were the original Galacticos, a cosmic label that Real Madrid would later use. Only the LA Galaxy, another cosmically named brand, could claim a higher worldwide profile among US soccer teams. International media pay attention to the Cosmos more than any other NASL, and perhaps MLS, team. International stars are attracted to the Cosmos because of the famous players who have worn the shirt. When it comes to relevance on the world stage and in recruiting players, the brand means a lot. In the local market, it has not meant as much. You have to be around 40 years old or older to recall the Cosmos heyday. That most successful period of that heyday took place in a different part of the metro area than Long Island, at Yankee Stadium and then New Jersey. Any dormant, nostalgic fan base would more likely be in the Red Bulls backyard. New York City FC has shown that a newly created brand, even one based on a parent team in England, can draw regular crowds of 25,000 plus. When it comes to attendance, the brand is essentially irrelevant. How Does This Get Fixed, And Who Can Help? The Cosmos need to play in a section of the New York City metropolitan area that is distinct from the New York Red Bulls and New York City FC. They need soccer fans in the area that feel a sense of ownership in the team. With the Red Bulls in Harrison, New Jersey, they are well-positioned to be the team of North Jersey. With NYCFC playing in the Bronx, they are well-positioned to be the team of the Bronx and Upper Manhattan, as well as Westchester (NY) and Fairfield (CT) counties. The Cosmos have the opportunity to own Queens, Brooklyn and Long Island, as club management correctly identified earlier when putting their eggs in the Belmont basket. In my experience, they are two unofficial, core alignments in New York sports fandom. Not everyone follows these strictly, but these are the most common. Yankees (MLB) fans are usually New York Giants (NFL) fans, and often Knicks (NBA) and Rangers (NHL) fans. Mets (MLB) fans are often Jets (NFL) fans, and often Islanders (NHL) fans. The NHL affiliation might switch to the Devils for those in New Jersey. This connection goes back to the historic locations of the teams. The Jets once shared Shea Stadium with the Queens-based Mets before sharing a ground with the Giants. The Islanders played in Nassau County for many years. Regional loyalties associated with the NBA Nets can be murkier, as they have roots in Long Island, having played at Nassau Coliseum from 1972-1977, in New Jersey from 1978-2011 and now in Brooklyn since 2012. The Yankees’ ownership in NYCFC gives it an edge with the Yankees-Giants-Knicks-Rangers set. If the Cosmos would like to be the primary soccer team of Queens-Brooklyn-Long Island, they would be wise to form marketing alliances with the Mets, Islanders and Nets as well as perhaps their brethren in green-and-white, the Jets. Of those groups, the Mets have shown the most interest in soccer. Citi Field has hosted four soccer friendlies, the first being an international match between Ecuador and Greece that drew over 39,000. A friendly between Juventus and Club America drew a little over 20,000. In the mid-2000s, the Wilpons, owners of the Mets, had the inside track on the New York City MLS franchise. The Wilpons’ MLS dreams faded away after the Bernie Madoff scandal damaged their finances, and their MLB team endured some lean years. The Mets returned to the World Series last year, and the Wilpons’ fortunes seem to be better these days. They are politically influential in Queens when it comes to getting anything built and one can only imagine that MLS’s alliance with the Yankees did not sit well. An alliance with Wilpons could offer the Cosmos both short term and long term benefits. In the short term, the Cosmos could use MCU Park in Brooklyn for their regular NASL and low profile US Open Cup matches. 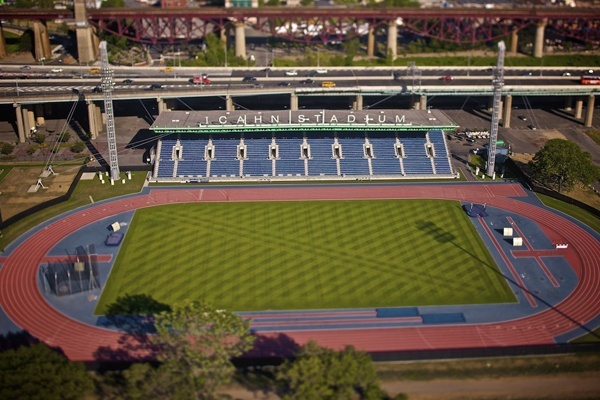 The Cosmos have played at MCU twice before, and with the application of Nexxfield it could be a more attractive venue for soccer. The Mets-owned farm team, the Brooklyn Cyclones, are the primary tenant at MCU. They play in the short-season New York Penn League, which operates from mid-June to early September. Thanks to the split season format and with generous scheduling from NASL, the overlap could be minimized. Higher profile matches such as US Open Cup derbies vs NYCFC and NYRB, the Soccer Bowl and any friendlies against world famous opponents could be played at Citi Field. If the Cosmos were to take the alliance as far as to allow the Wilpons to buy-in as investors, the influential Mets owners could assist them in getting a stadium deal done in Queens. Should a deep partnership with the Mets be too hard to forge, playing in Brooklyn positions the team in a borough that wants them there long term. 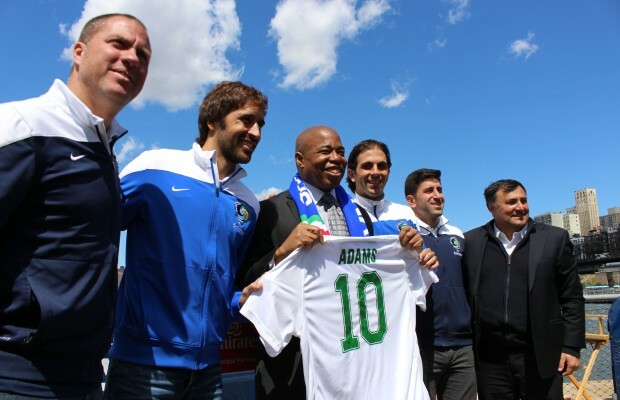 In June 2015, Brooklyn Borough President Eric Adams tweeted, “I want to bring a #worldclass #soccer team to #Brooklyn and a new stadium. Why build in Belmont when you can go to #Brownsville or #BedStuy?” MCU Park as the Cosmos’ new temporary venue would also work perfectly if the team were to follow Mr. Adams advice and build in Brooklyn. Certainly they could count on him as a powerful ally in getting something done there. Near term success for the Cosmos would look like being in an area where the community embraces the team as its own, and generates crowds near capacity or of 10,000, whichever is the lesser number. 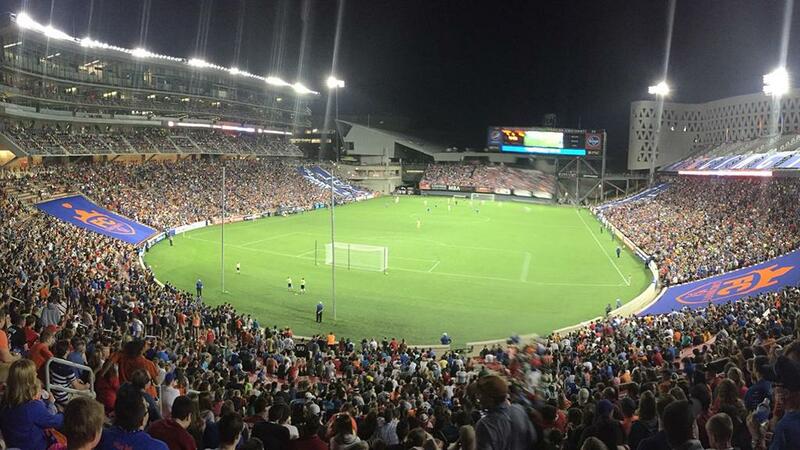 In an era where FC Cincinnati is drawing over 20,000 regularly, Indy Eleven often sees 10,000+ attendances and Louisville draws 7,000+ regularly, the Cosmos should able to fill MCU Park’s 7,500 capacity or close it each game if they make it their temporary home and market the team correctly. In addition to the items needed for short term success, long term success would mean getting the stadium done and having adequate revenue opportunities around it to support the ambition of the Cosmos to be the top soccer club in North America. Once a world class stadium is in place, the Cosmos should be shooting for regular attendances in the 15,000-18,000 range. Do They Have The Right Leadership To Get Them There? The Cosmos are blessed with two incredible assets in terms of leadership. The ownership group represented by Seamus O’Brien has shown a willingness to invest in the club’s long term success. They are willing to write a $400 million check for a proper stadium complex. They are putting out the strongest roster in the league each year. They are investing in an academy. The committed ownership group is arguably the Cosmos’ best asset. On the sporting side, Giovanni Savarese has been outstanding. The Cosmos have won two titles in three years, have had success in the Open Cup versus local rivals and have developed a culture that makes players want to play for the team. Gio has surrounded himself with one of the best staffs in the country, and has experience building a strong academy program during his past with the MetroStars/Red Bulls. You can make an argument that Gio is the team’s best asset as well. When it comes to building a stadium, Cosmos COO Erik Stover has the experience with Red Bull Arena, one of the truly excellent soccer venues in this country. Where the Cosmos fall short is their go-to-market strategy. They appear to lack necessary top level leadership is in the areas of sales, marketing and community outreach. There are plenty of examples of clubs in NASL, USL and even NPSL that are overachieving in terms of attendance. The Cosmos are clearly underachieving. The Cosmos would well to make key hires out of some of the overachieving teams like Sacramento, Cincinnati, Louisville and Indy to lead their go-to-market strategy. Investing in top talent in this area will help the club maximize the revenue potential of any temporary or permanent home in the future. With the Right Leadership in Place, What’s Next? Should the Cosmos choose to leave Hofstra, as it appears they will, they need to treat their next move as a re-launch of the team from a sales, marketing and community outreach perspective. While they should tell a story about their historic brand and their recent success, they cannot depend on the brand to draw crowds. It has been demonstrated that is not one of the things that the brand is good for. It is only one piece of the puzzle, and the Cosmos would do poorly to be over reliant on it. It is not a replacement for doing heavy lifting in the community. If they go to Brooklyn, the Cosmos already have the Borough President in their corner. They already have an affiliation with the Brooklyn Italians soccer club as well as Central Brooklyn SC. Unfortunately, the Paul Kemsley regime prior to the current ownership alienated one of Queens’ major soccer youth programs in Bleu Weiss Gottschee, who now partner with NYCFC, but you can’t win them all. 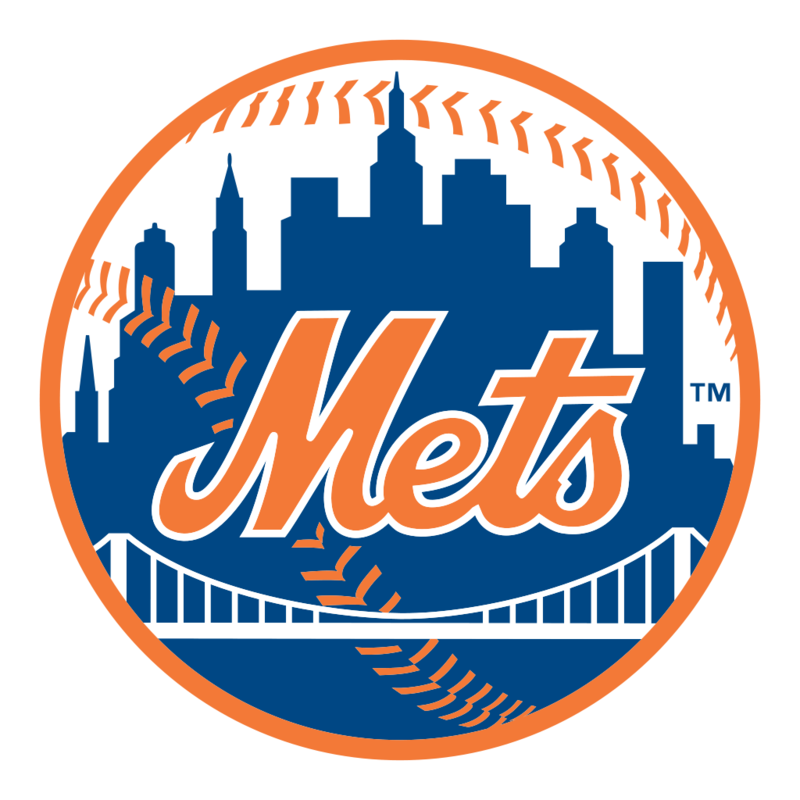 Exploring alliances with the major New York sports clubs with fan bases in the Queens-Brooklyn-Long Island area like the Mets, Jets, Nets and Islanders will be important too. Especially the Mets. In general, the Cosmos would do well to copy more moves out of Peter Wilt’s playbook to make inroads in the Brooklyn community, while continuing their partnerships on Long Island. Their relationships with political leaders in Nassau County will be important to maintain until final word comes down on Belmont. 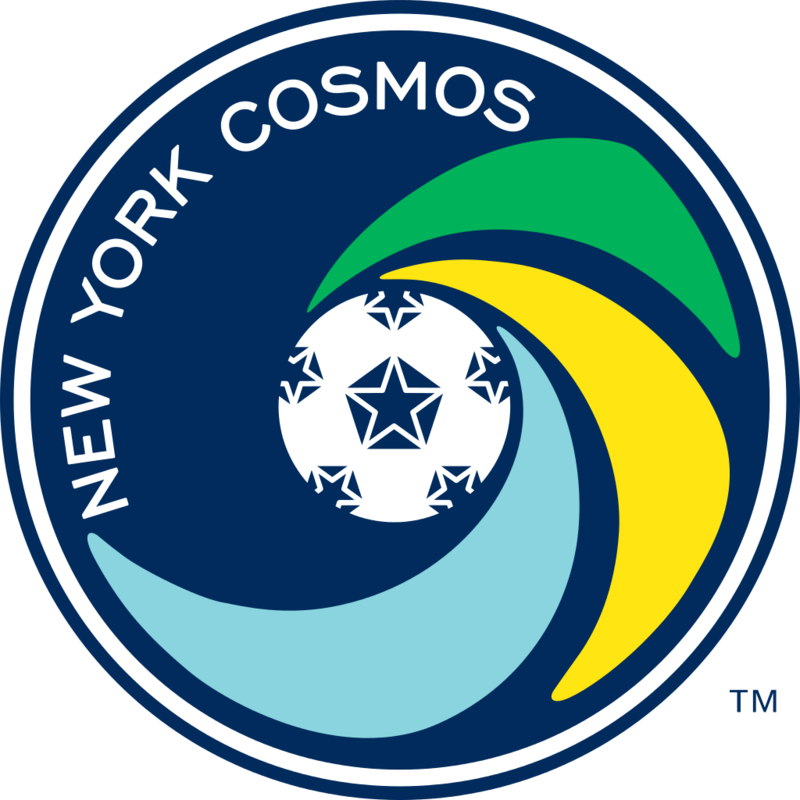 If the Cosmos do not get positive news from the ESDC within the next few weeks, they must urgently begin to find a new location on which to build their world class stadium in the Queens-Brooklyn-Long Island section of the New York City metro market. They have been waiting far too long. Even the most patient, long-term minded investors need to see progress towards realizing the vision they are investing in. The survival of the Cosmos depends on getting started on their long term home soon, and generating excitement for the club in the community it will be in. While their demise is not imminent, the Cosmos’ present situation is clearly unsustainable. Losing the Cosmos would not only be bad for the fans, but for the North American Soccer League and US Soccer in general. US Soccer needs more organizations like the Cosmos willing to invest in building a truly great soccer club from the youth ranks up to the pros. Now is the time for the Cosmos leadership to action to make sure that things do not get that bad. The future of the club is at stake. Solid article. All fans of the Cosmos or fans in general that want to know what is up needs to read this. Excellent, thorough article. I’m a BK-based, lifelong New Yorker, and I just can’t get to Hofstra on a Sunday night. I’d be so pleased if the team could be based either in the city or closer, more accessible on public transit. Just a clarification. That’s not a subway stop at Belmont Park. It’s the Long Island Railroad. The subway only extends as far as Jamaica which is several miles west. Thanks, I updated the article to reflect that. Wow, what a well thought-out and thorough article. Great work! I’m new to the site but I’ve read a lot of really good articles here. i would love the BK plan. Why not split the season ala the expos and play half of the home games in BK and the other half in the Ducks park to appeal to the LI crowd?